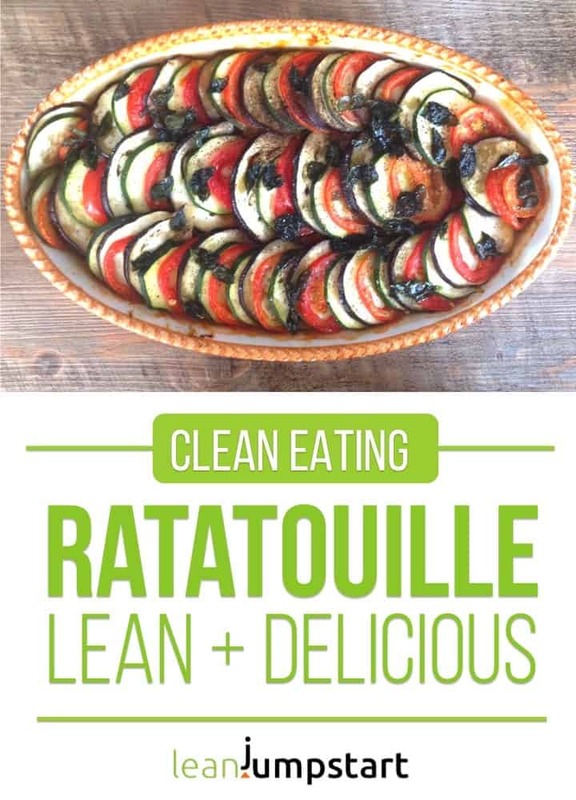 This clean and baked ratatouille recipe will blow you away! What started out as a leftover meal for poor people in the South of France, especially in Nizza (Provence), slowly conquered the hearts of many gourmets. Each country has its own leftover meal made from typical regional products. The ingredients are very variable and only the cooking method remains the same. Ratatouille is exactly the French counterpart to the American stew, the German Eintopf, the Spanish paella or the Asian curry. One thing that clearly points out that this used to be a dish for poor people is the name itself. “Rata” can be translated as ” fodder” and “touille” means just “stirring”. If you translate it literally, ratatouille means something like “the stirred fodder”. People often used vegetable waste for preparation and cooked it for hours. Ratatouille is nowadays well-known throughout the world and so popular that Disney dedicated a film specifically for this dish. Today I would like to show you a slightly different version. What the little rat has achieved in the movie “Ratatouille”, I would like you to accomplish as well. 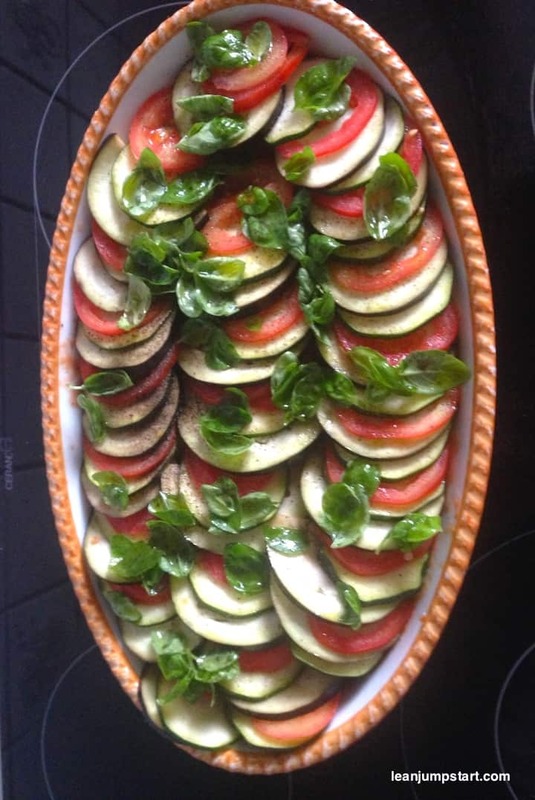 This is a refined presentation of the traditional ratatouille recipe that has its orginin in France, especially in Nizza (Provence). My interpretation is perhaps a bit more elaborate than the classic original, but a real treat for the palate. Chopping everything up and making a classic stew based on aromatic vegetables, that is probably the typical and quickest preparation method. But sometimes it is worth to invest a little more time in the kitchen. This is true even if you are very busy and prefer simple and quick clean eating recipes. For this vegan recipe I needed 90 minutes from cutting the vegetables till serving. Yes, I know…this is really long for me. You won’t find many wholesome recipes on leanjumpstart.com that will beat this long preparation time. Standing almost one hour longer than usually in the kitchen made really the difference. This has not only to do with ratatouille’s gorgeous appearance but also with the overwhelming taste of this meal. Why? But the thinly sliced eggplants arranged with other veggies combined with a herb oil seasoning brought out the best of eggplants taste. They transformed us to real eggplant fans. And while the lean, vegan ratatouille food is baking in the oven melting flavors into a very satisfying dish, you have plenty of time to clean up your kitchen and set the table. Check it out for yourself! Preheat the oven for 190˚C/375˚F. Slice the eggplants, zucchini, and tomatoes, into thin slices (approximately 1/16-inch rounds), then set aside. (You can also use a mandoline slicer for the vegetables). Heat 2 tablespoons of olive oil in a pot. Sauté onions, garlic, and bell peppers until soft. Add crushed tomatoes, thyme and season with salt and pepper. Then transfer sauce to a casserole and smooth the sauce with your spatula. Arrange the sliced veggies in alternating patterns, (e.g. eggplant, zucchini, tomato, eggplant etc.) and season with salt and pepper. Combine herb oil seasoning and sprinkle over veggies. Cover the casserole with tin foil and bake for 35 minutes. After 35 minutes, uncover, then bake for an additional 15 minutes. 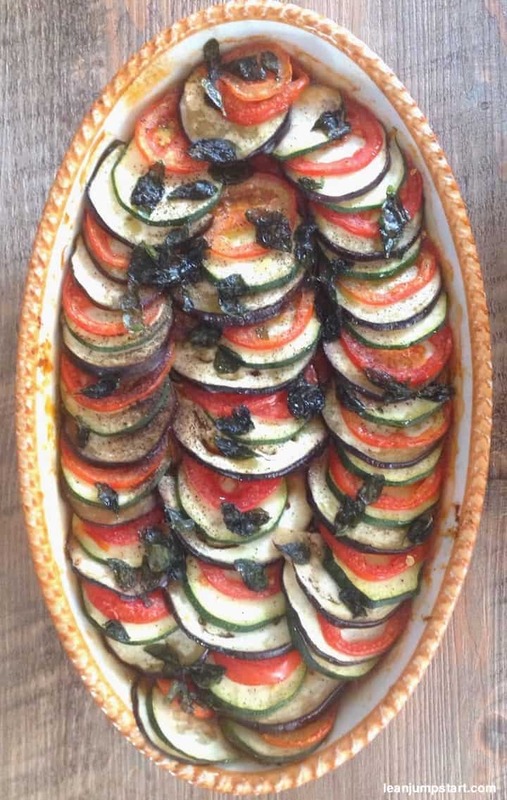 Serve ratatouille as a side dish with whole grain rice or as a main dish. Tastes fantastic also the next day. Can’t eat all at once? The great thing about this plant based casserole is, that you could freeze it in airtight containers for up to 3 months. To thaw, place in the fridge overnight. Reheat in the microwave or baking oven. Note that the texture and consistency of the vegetables that have been frozen will be slightly mushier. How to combine this vegetable ratatouille? The traditional way to combine an easy ratatouille recipe is to serve it with white bread, potatoes, meat or fish. I love however to serve this refined composition with brown rice, polenta or mashed potatoes. On festive occcasions I serve it with a salmon steak. This is such a lovely preparation! I love ratatouille! Thank you for your kind words, Mary! Yes, this colorful and nutrient-dense eggplant is amazing! This looks so fresh and the flavors were amazing! Everyone enjoyed it, thank you! You are very welcome, Noelle! I’m glad that all of you liked this flavorful dish. This is such a beautiful way of preparing and serving vegetables. I’d eat a whole ratatouille by myself! Thank you Alina! I can very much relate to you because I could eat the whole content of the casserole by myself. I’ve been cooking my whole life, yet have been… *gulp* … never very good at cooking eggplant. Now I can’t WAIT to try this dish!!! I kinda like chopping veggies, I just kinda zone out. My mom brain needs that LOL! Thanks for sharing all of the steps and tips for making this dish perfectly, it looks fabulous! I bet it would impress for a dinner party, too! Mmm ratatouille has always been a favorite of mine. I’ll have to try you’re take on it as it looks delicious! Thank you Lisa. I’m glad that you like my take on it, although you might need some more time in the kitchen. But I promise you it is worth it.